Chinese striker Han Zi Zao has the opportunity of a lifetime coming up when he gets set to faces Thai icon Nong-O Gaiyanghadao for the inaugural ONE Bantamweight Muay Thai World Championship. The two world-class strikers take center stage in the main event of ONE: CLASH OF LEGENDS on Saturday, 16 February in Bangkok, Thailand. The most successful ONE Super Series competitor of 2018, Han managed to string together three straight victories, which then earned him a shot at world championship gold. “I will seize this opportunity to win the gold belt. 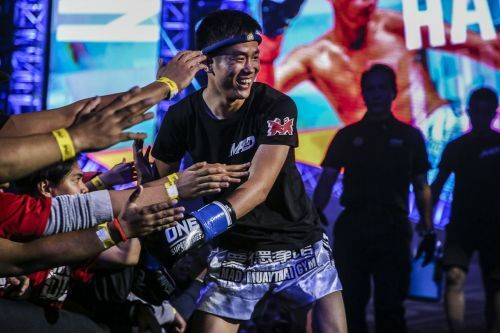 It is the best reward for all my work,” Han shared with the official ONE Championship website. More than being in the front of the line of top contenders, Han relishes being able to go up against a bonafide legend in the sport and a competitor that he considers an idol in Nong-O, who is arguably one of the most respected Muay Thai practitioners in Thailand. Facing Nong-O for the world title is nothing short of an honor, says Han. “I have grown stronger, and eventually, I can face him on the same level. I’m proud of myself,” he added. Breaking down what his opponent brings to the table, Han says that Nong-O is more or less the complete competitor, with strengths lying in both offense and defense. With a monumental opportunity looming, Han is not lost in the gravity of the situation. The 23-year old has nothing but respect for his opponent, but at the end of the day, with a world title on the line, it is about being the better competitor inside the ring.